Warmer temperatures are fast approaching Northwest Florida, leading many residents to escape into their home to relax in the cool, steady breeze of their ceiling fan. Here are some tips on how you can troubleshoot issues with your fan before calling an electrician! Make sure there are no obstructions and that the blades move freely by giving the fan a gentle spin. Make sure that any wall switches connected to the fan are in the “on” position. Henderson Electric Pro Tip: In a multi-switch set up, up is not always “on”! Be sure to try all switches in all positions. Pull the fan chain several times each time you flip a wall switch. On most fans, the chain will change the fan between off, high, medium and low settings. If your fan has a light kit that is also controlled by a chain, the fan control is generally the shorter of the two. Check the breaker box to confirm the power is on. If you discover the breaker has tripped, simply reset the breaker. Turn the power off at the circuit breaker. Loosen the screws securing the fan canopy. Ensure all wire connections are intact and secured with wire nuts. Henderson Electric Pro Tip: If your fan’s wiring uses a harness connection in the housing, be sure it is securely fastened and that all color-coded cables are aligned. Check the directional switch on the fan canopy to see if the switch is in the central, “neutral” position. The switch should sit all the way left or right, depending on whether you want air to move up or down. If, after conducting these troubleshooting steps, your ceiling fan is still not working, you may have a more serious electrical problem. Give us a call and schedule an inspection by one of our experienced electricians! Make sure the ceiling fan is spinning in the right direction. Most residential ceiling fans are designed to hang between seven and eight feet off the floor. If the blades on your ceiling fan are higher than eight feet, it can be lowered by installing a down rod. Older ceiling fans may become overheated after years of use. Turn off your fan and touch the base to see if it is hot. If so, a new fan motor or bearings might be in order! Check the simple fixes first when combating this issue! Make sure the maximum wattage and size/shape of the bulb are recommended for your ceiling fan. Additionally, check if the bulbs are snug and firm in their sockets. If the chain control for the lights is not working, you may need to have the switch replaced. 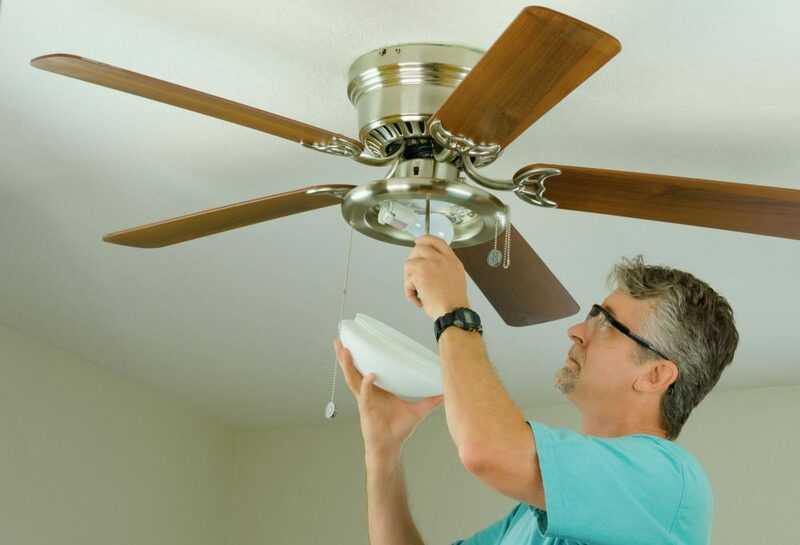 Look for signs of faulty wiring in the ceiling fan and light kit. Common signs include bulbs flickering and/or regularly burning out faster than anticipated. If you see signs of faulty wiring or you suspect an electrical issue after these steps, call a professional! Tackling anything beyond simple electrical issues can be a complicated and dangerous task for the average homeowner. When you need trustworthy and reliable electrical work, call Henderson Electric!